This week I have had so much fun with our Back to School Basics posts! We did Name art, a Number Toy Hunt, a Shape Clothespin Match activity, and a Giant Alphabet Connect the Dots game! 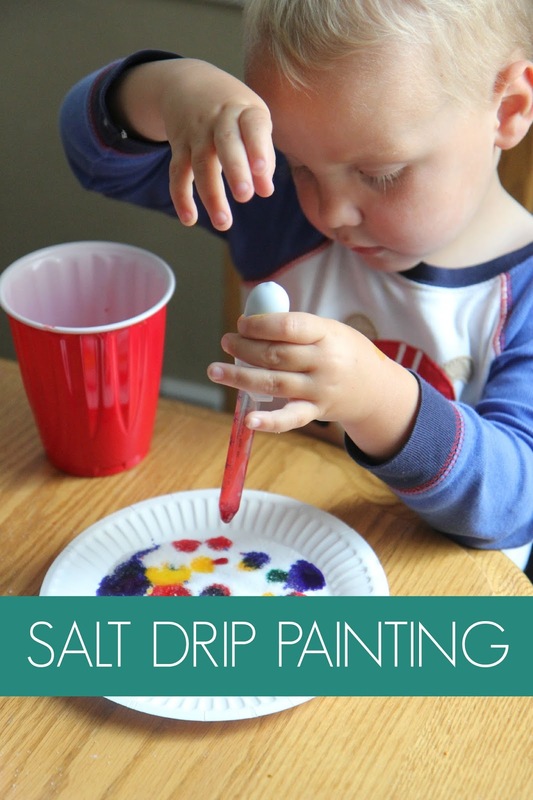 For our last activity of the week today we are sharing a cool way to play and explore colors- Salt Drip Painting! This is great for toddlers, preschoolers, and older! We have shared simple drip painting before and fizzy drips and both are always a hit. This activity is even simpler and I loved the easy set up and the reaction from my toddler and preschooler when they got to play with it! To set up this activity just set out little cups of different colors of liquid watercolors. You can dilute them with water depending on how vibrant of colors you want. Then pour a few tablespoons of salt on a paper plate and spread it out so that there is a thin layer of salt on the plate. 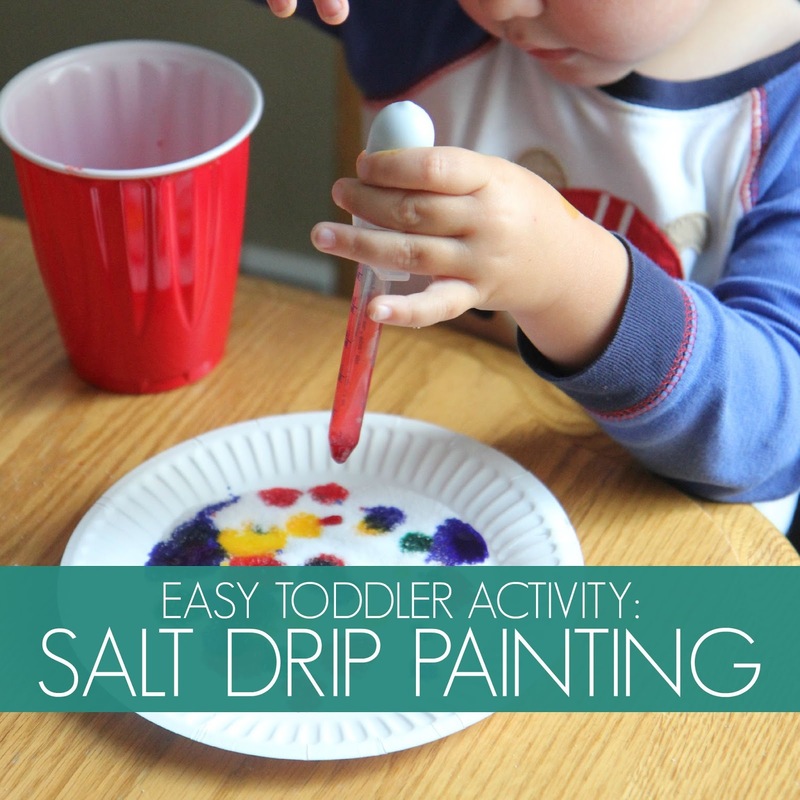 Lastly, use your dropper to start dripping colorful drops of liquid watercolors onto your salt! The colors are so cool to watch! My son and daughter had fun mixing the colors while they dropped them and also seeing which ones were the brightest or spread the furthest. My kids were really fascinated by the salt and watercolor combinations and wanted to mix the colors a bit by hand too. I gave them toothpicks so that they could explore the colors and salt without making a disaster all over their hands. They drew in the salt and made lines and letters. It was a lot of fun! Another favorite way that we like to explore salt is through salt painting! Have you ever tried it? Make sure to stop by next week to catch more of our Back to School basics posts and possibly a few other fun things, if I get organized enough! Have a Happy Weekend! PS- This is a salt and watercolor exploration activity! This is not an art project that you hang on the walls or display. 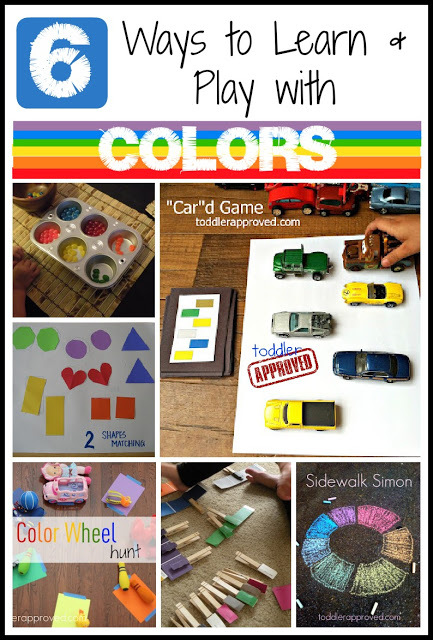 It is solely process based and meant to teach your child about colors and color mixing and color recognition and names.